KAPA Hawaiian FM morning personalities Jaz and Ka’ea welcomed Kahalawai to the KAPA Cafe. 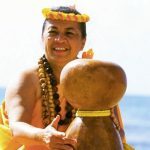 Kahalawai consists of Dana Pi’ilani Arias and Joshua Pilialoha Kahula. Dana has played guitar on many artists’ albums and released his first solo album “Dash-A” in 2015. Joshua was lead singer of the popular Maui band Nuff Sedd, whose debut album was recognized at the 2005 Na Hoku Hanohano Awards for Reggae Album of the Year. Their single “Ke Ali’i” is currently out now.